If you have Windows PC or laptop, there's no shortage of VPNs to choose from, but many are not fit for purpose. A top VPN should offer fast speeds, great security features, and be easy to use. If you're looking to unblock streaming services such as Netflix and Amazon Prime, even fewer VPNs make the grade. 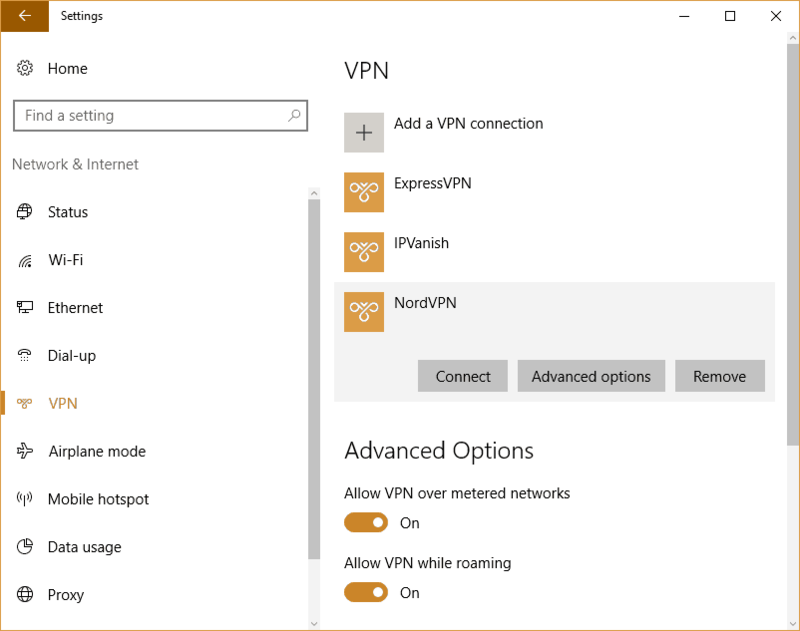 We'll show you the best VPNs for Windows 10 and explain how to set them up. 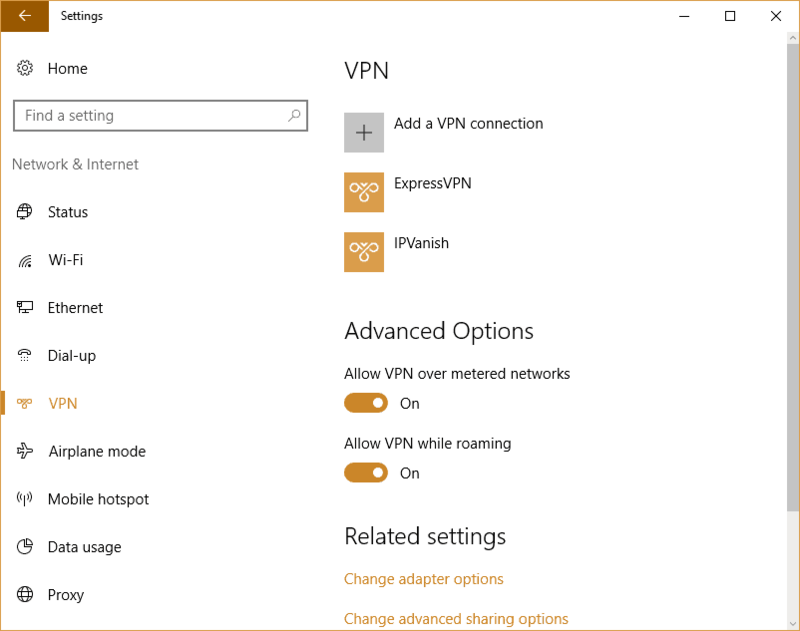 This article will review the best VPNs for Windows 10 as of 2019, serve as a guide on setting up a VPN connection, and explain why you should use a Windows 10 VPN to browse, stream, and download. We will also point out some VPNs with poor track records that should be avoided. Skip to the list of the best VPNs for Windows 10. Most of these trackers and telemetry services can be disabled, but they can also be switched back on without your knowledge during an update. Some cannot be turned off at all. So how can you protect your privacy and keep using Windows 10? First off, check out our giant list of privacy tools; there’s a section just for Windows 10 users. Next, get a VPN. VPN software encrypts and anonymizes all your online activity. This is important for P2P filesharing so your internet provider can’t snoop on torrents and other downloads. It also protects you on unprotected public wi-fi networks and even unblocks geo-locked websites and services like Netflix. 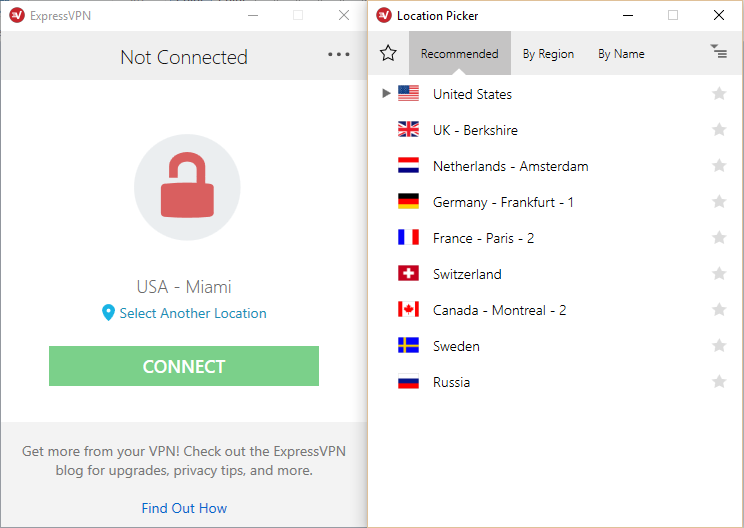 ExpressVPN: The best all-around VPN for Windows 10. Easy to set up and use, fast speeds, and airtight security. Unblocks all major streaming sites including Netflix. Includes a 30 day money-back guarantee. NordVPN: Zero logs, unblocks Netflix and other streaming sites, tons of features you won’t find elsewhere. CyberGhost: Great security, very fast, and makes it easy to unblock streaming sites like Netflix. IPVanish: Strong security paired with fast speeds. No logs. VyprVPN: Strong security, easy to use, and unblocks US Netflix. App quality is pretty self-explanatory. Setup and use of the native Windows client should be easy and intuitive. The OpenVPN protocol is open-source and audited. It’s relatively fast and widely regarded as the most secure and trusted protocol available. It doesn’t come built into Windows 10 like SSTP, L2TP, and PPTP, so these VPN providers must provide the user with an app that makes setting up OpenVPN easy. DNS leaks are a known Windows 10 vulnerability, so VPNs that can suppress this are a must. A DNS leak nullifies a user’s anonymity by sending a web page request to their internet service provider instead of to a private DNS server through the VPN service. This allows your ISP and possibly Windows to track your web browsing. Because Microsoft is based in the US and is known to have complied with the NSA’s bulk surveillance program, we prefer VPN providers based outside of the US to avoid any further conflicts of interest. Ever among the top 5 in almost any category, ExpressVPN makes this list for its superb app. The Windows VPN software is the simplest option for those who want something that just works without fuss, and it boasts the fastest average download speed of any VPN we’ve tested so far—great for P2P filesharing and streaming. Users can opt to use ExpressVPN’s DNS servers whenever connected by toggling it in the advanced settings. ExpressVPN is incorporated in the British Virgin Islands beyond the reach of the GCHQ and NSA, and it keeps no usage logs. It’s also one of the few VPNs to work with Netflix. BEST VPN FOR WINDOWS 10:ExpressVPN is our Top Choice. Leads the way with its easy to use no-fuss Windows 10 app. It has a vast server network that is optimized for high-speed connections. Hard to beat on privacy and security. Works with all major streaming services including Netflix. There is a 30-day no-quibbles money-back guarantee so you can try it risk-free. Panama-based NordVPN has a true logless policy, meaning it keeps neither connection nor usage logs. Extra features include double-hop encryption, Tor over VPN, and a kill switch. Those plus DNS leak protection can all be switched on in the app settings. 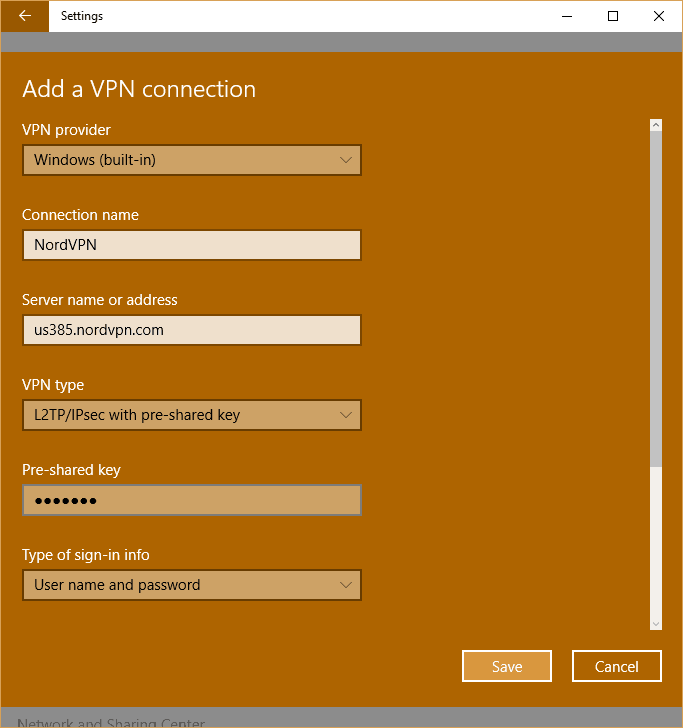 The Windows VPN client is detailed but not overwhelming for new users. The server list is categorized by recommended use–TV streaming, dedicated IP, Tor over VPN, etc–and each server is pinged so you can see which location offers the least latency. NordVPN can unblock Netflix. 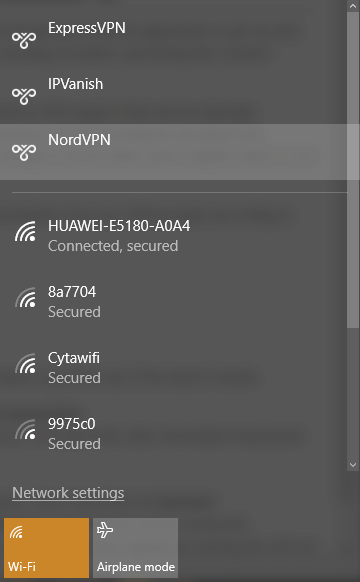 BEST BUDGET VPN :NordVPN is great on value. A real contender in all categories, has strong security features and allows up to 6 devices to be used simultaneously from one account. Includes 30-day money back guarantee. CyberGhost VPN offers easy offers easy-to-use apps and a large network that spans more than 1,100 VPN servers in over 40 countries. CyberGhost’s premium tier stores no identifying logs and protects your data in transit with 256-bit AES military-grade encryption on the OpenVPN protocol. Live chat is available should you encounter any issues. Speeds are excellent and Pro subscribers can connect up to five devices at the same time. CyberGhost can unblock US Netflix. GREAT VALUE:CyberGhost is easy to use. Another budget choice. Good on privacy. Streams HD video reliably. Can struggle with some popular streaming sites. 45-day money back guarantee. US-based IPVanish uses OpenVPN with strong encryption and features a true zero logs policy, meaning it records neither session nor traffic logs. It’s one of the only VPNs to sport a Tier 1 network, meaning it owns all of its own servers rather than renting physical or virtual space from someone else. Because of that, we’ve overlooked the fact that it’s based in the US. IPVanish boasts a selection of almost 60 countries and all connections are DNS leak protected. LARGE NETWORK:IPVanish is great for families. Solid Windows 10 app. Good at unblocking most geo-restricted content. Recommend for their high standard of privacy. Could do with a live support option. 7-day money back guarantee. Read our full review of IPVanish here. Most of VyprVPN’s team is located in the US, but parent company Golden Frog is officially incorporated in Switzerland. The app gives a graphical readout of real-time data use and a transparent overview of your connection settings including IP address, protocol, and whether the NAT Firewall is enabled or not. DNS leak protection can be toggled in the settings. The slick app comes at a bit higher cost than some competitors, but it’s within reason. One downside to consider is VyprVPN’s logging policy: your real IP address, VyprVPN address, and connection logs are stored for up to 30 days. VyprVPN can unblock American Netflix. UNLIMITED DATA USAGE:VyprVPN is user friendly. 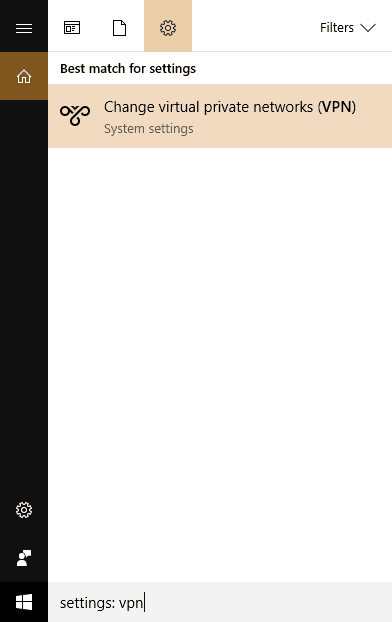 Windows 10 app is easy to use and provides a lot of real-time data. Excellent speed and uptime but not the cheapest option. 30-day money-back guarantee. 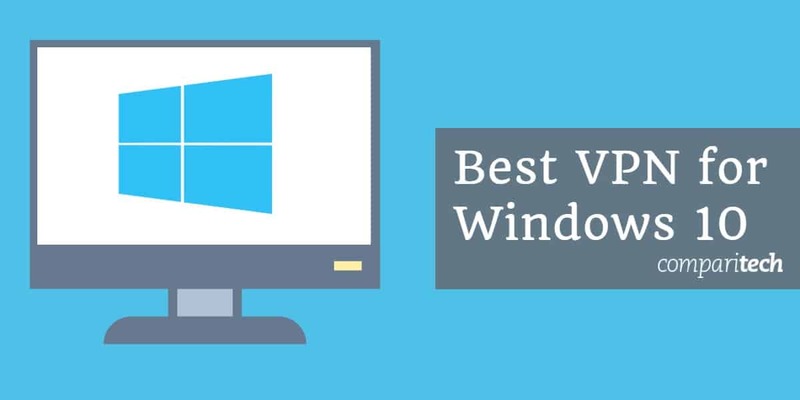 When deciding which VPNs Windows 10 users should avoid, free options top the list. We listed a couple here that the typical person would likely find on Google, but the same goes for pretty much all free VPN services. We passed on several paid VPNs as well because they either don’t protect against DNS leaks, are based in the US, or both. If you Google “free VPN for Windows,” Betternet will be one of the top search results. Betternet doesn’t collect user logs, but the app itself is part of an ad platform that accesses your cookies so as to target you with advertisements, videos, and suggested apps. It also doesn’t protect users from DNS leaks. It’s not that Betternet is malicious–in fact, it’s quite transparent in how it operates. We might even recommend the mobile app as a decent free alternative. But for Windows, we have to say pass. Hide.me is the other free VPN for Windows that ranks high on Google. While it has premium plans that aren’t so bad, the free version limits speed and data transfers to 3 Mbit/s and 2GB, respectively. It also doesn’t support OpenVPN, which is our recommended protocol for security. Free users are limited to three server locations, and port forwarding is not available (useful for torrenting). On the plus side, Hide.me is completely log-free. Hola is a peer-to-peer proxy browser extension that works sort of like a free VPN but has no centralized servers. Instead, users route their internet traffic through other Hola users’ devices whenever idle bandwidth is available. Depending on your local laws and regulations, that could make you responsible for the activities of other users. Furthermore, Hola once hijacked the computing resources of its users, turning them into a botnet army, to carry out distributed denial-of-service (DDoS) attacks on websites and distribute pirated materials. If you want to double-check that your DNS leak protection is working, you can run a DNS leak test here. Run the test with your VPN enabled and then again with it disabled to get an instant readout of the test results. Even if a VPN advertises DNS leak protection, websites like Hulu and Netflix can sometimes still force a request to leak out over the IPv6 protocol. By default, most VPNs force all DNS requests onto IPv4 and avoid IPv6 altogether. But if IPv6 is enabled on your device, this might not stop an IPv6 DNS leak on Windows 10. First off, make sure you ask your VPN provider’s customer support if they have servers that unblock US Netflix and Hulu. If it does and you are connected to one of those servers, but the site still detects you are using a VPN service, then you may need to disable IPv6. IPv6 is now disabled, and you should no longer leak IPv6 DNS requests. Related: What’s the best VPN for Hulu and for Netflix? With all of the above providers, you need only download and install software to get up and running with a VPN on Windows. Connecting is as simple as logging in, choosing a location, and hitting the Connect button. But if an app doesn’t suit you, Windows 10 has built-in VPN support that can be manually configured. The OS doesn’t support OpenVPN however, so we recommend choosing from L2TP/IPSec, SSTP, or IKEv2. Avoid PPTP; even though it can be faster and is slightly easier to set up, it has known security vulnerabilities. In the search bar, type “VPN” and click the menu cog at the top of the search results. Under VPN provider, choose Windows (built-in). Fill in all of the other information mentioned above accordingly. Wait a moment for the connection to be completed, and that’s it! You’re connected. After you set your VPN up the first time, you can access it more quickly by clicking the wifi icon in your system tray. It should be listed near the top. 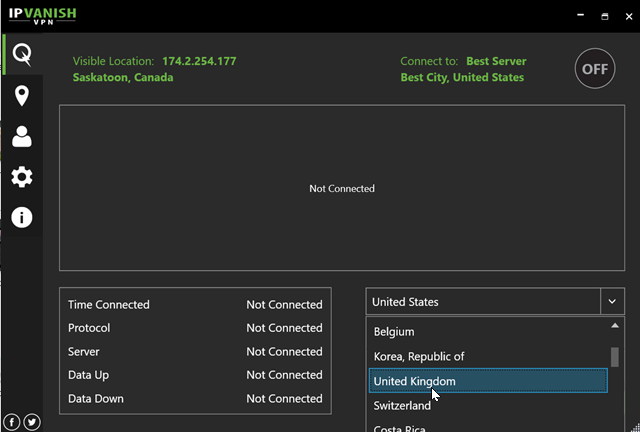 Ultimately, the best VPN for Windows 10 is the VPN you use. If you find the service unreliable, slow, or unintuitive to use, go with something else. If it’s too cumbersome to turn on when you connect to public wi-fi, then there’s no point in having it. All of the providers we recommend offer money-back guarantees, so you can try them with no risk. Sorry for the lack of knowledge here, but why would I use both a paid (or free) VPN service and use the Windows 10 VPN setup utility? Hi James, the reason is because even if you use the VPN setup utility, you still need a VPN server to connect to. Windows doesn’t provide that for you. So if you buy a paid VPN service, it gives you both the VPN app and the VPN servers. Alternatively, you could connect to your paid VPN provider with the built-in setup utility, but the apps tend to be easier and more robust as far as security and features. Hope that helps! My laptop crashed. When I got it back my VPN was gone. All I can remember is Isec.